I got out to close the gate upon returning to the driver’s seat I noticed that horrible smell of melting wires. I figured it unwise to put a burning car into the garage so I shut it down immediately. The heater was on at the time. It never actually caught fire thankfully. Upon reset, the check engine light comes right back on immediately. Any idea where the electrical burning smell is coming from? Engine bay? Under the dash? Etc? Would help narrow down what it's doing. YouTube has some p1663 videos but if it's something like a blown fuse you might want to figure out why it blew. Sorry it was emanating from between the gap between the instrument cluster and the steering column. You got me off in the right direction! The instrument cluster fuse was shorted and the new one popped immediately, with the key off. I disconnected the instrument cluster and the short disappeared. 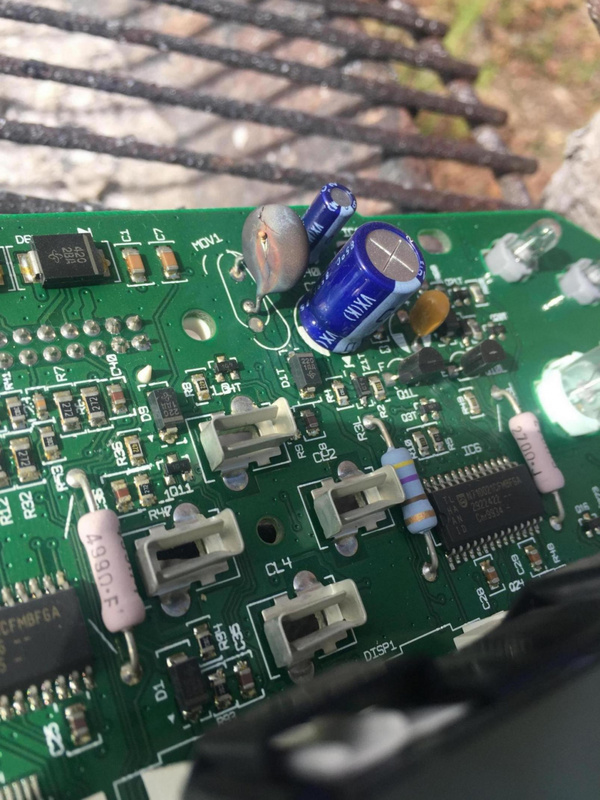 Turns out it wasn’t a short circuit in the wiring harness but a capacitor on the cluster circuit board. Gotta love solid state automobiles! thats a MOV not a capitator that burned. The Metal Oxide Varistor or MOV is a voltage dependent, nonlinear device that provides excellent transient voltage suppression. The Metal Oxide Varistor is designed to protect various types of electronic devices and semiconductor elements from switching and induced lightning surges. When exposed to high transient voltage, the MOV clamps voltage to a safe level. A metal oxide varistor absorbs potentially destructive energy and dissipates it as heat, thus protecting vulnerable circuit components and preventing system damage. Varistors can absorb part of a surge. mcoppola and Paul1958 like this. 2005 Ford Focus ZX3 SES 2.0 DuraTec with mods starting to be installed. Check the wiring going through your hatch hinge. I'm gonna bet that you've got a worn wire or three and sent a 12v feed through a data line when you closed the hatch. So smashing it and driving around without it is probably just going to cause more electrical problems down the road. Good to know. Is there any way of locating the replacement MOV1? I’m sure Ford would prefer that I buy a brand new cluster instead of a 59 cent component. I can just get one from the junkyard, but I really hate replacing a 19 year old electronic component with another 19 year old component. I checked the hatchback and there is no damage to the wiring. The fuse stopped blowing once I destroyed the MOV1. If you need to, just get a low mileage cluster from a pick n pull, (anything lower than your current mileage) and use Forscan to change the mileage once you've swapped the cluster. Edit: you could also grab any cluster and just swap the damaged part too and keep using your existing cluster. Probably could get one for cheap off the buy/sell/trade from someone who has a high mileage cluster or one with damaged servos or something. Last edited by pizzaboy192; 03-19-2019 at 11:15 AM.